Working with scientists to plan, organise and carry out field work, measuring water properties such as temperature, salinity and current speed and direction. I spend about 2-3 months away in total each year on boats or ships and in Antarctica. I use special scientific instruments to measure the ocean. The rest of the time is planning, learning new technology and writing computer software to analyse data. Waking up on sea ice with 500m of ocean below, no waves to make me feel sea sick and a spectacular view of Mount Erebus. Over the past couple of months I’ve done some work with Craig Stevens in Fiordland using a small boat, then had a week in USA learning how to pilot an underwater glider. After this I’m going to spend a month on a Korean ship 300km north of here recovering some instruments I deployed in the ocean a year ago. I was lucky enough to bring Max the bear down here to Antarctica in January 2012. Max is very well travelled! We had some special instruments on the sea floor in Cook Strait for a few months and when we recovered them we found that one of the shackles had nearly completely dissolved (10mm had become 1mm). We snapped it with our fingers… if it had been one week later we would never have got the gear back! I have also learned that when seals first appear in a hole to stand clear as they can blow snot at you! Road cycling, pottering in the vege garden, collecting pine cones and firewood with friends and family. 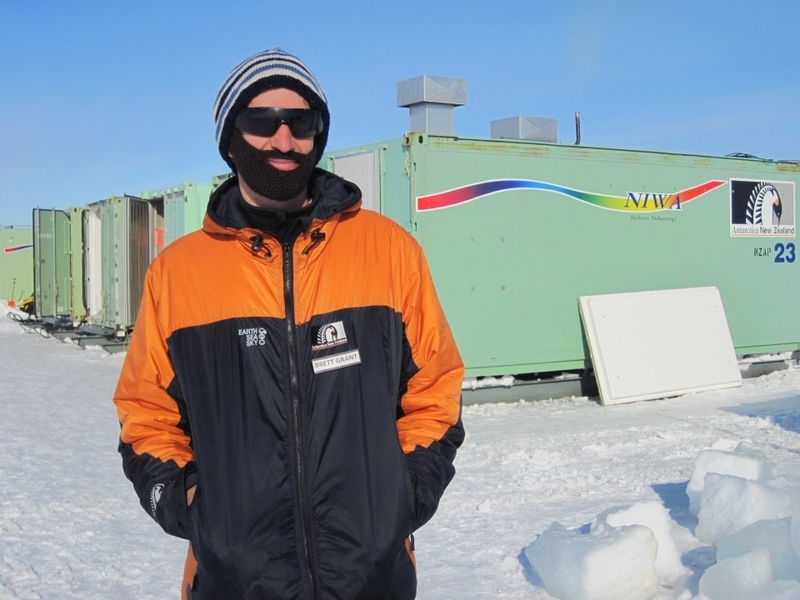 Brett Grant is an oceanography technician. Image: LEARNZ.